Code faster with the IDE for today’s web languages – Python, PHP, Perl, Golang, Ruby and more. 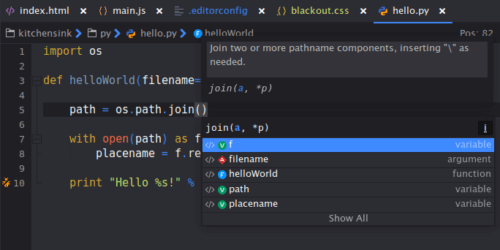 Powerful editor with syntax highlighting, autocomplete, code refactoring and more. Great tools for pair programming and collaboration. Learn more. Check out Komodo Edit for just the basics, or View All Features of Komodo IDE. Code Intelligence is smarter and faster than ever before. Increase your productivity with smarter and more responsive autocomplete and symbol browsing, while enjoying overall faster performance. So, running the full debugger is a bit much, but toggling all those print statements gets tiresome? Now you can quickly toggle print statements, as well as easily create them, simply by clicking your editor margin. Resolve issues faster and focus on coding. Just highlight any word or code snippet and trigger the relevant language docs from inside Komodo, making the process of looking up documentation much simpler. It even works when you’re offline! No need to switch back and forth between your browser and editor. 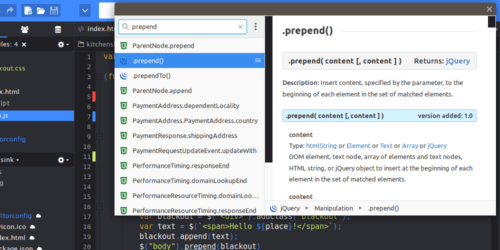 Now you can edit your HTML and markdown and test it all without leaving your IDE. Your preview will automatically reload whenever you edit the file – saving not required. But that’s not all. Komodo 11 includes Project/Folder Templates, Dependency Detector, Universal Package Manager, Clipboard Manager and added tools for Drupal, Laravel and WordPress. See What’s New in Komodo 11. As a passionate PHP developer, and having used competitor products extensively, I appreciate Komodo IDE every day. The improvement it and its add-ons have made to my productivity literally paid for the license cost in the first month. I appreciate your realistic licensing [for Komodo]—I paid for my own copy and I use it at home on my Linux desktop, on my laptop, and here at my day job. Brian Wilson, Alsea Geospatial, Inc.
Komodo is a great product. My favourite feature is the regex generator/tester. It’s saved me heaps of time and aggravation when coming up with complicated regular expressions to get through weblogs and the like. The increase in productivity I got from the interactive debugging environment in Komodo IDE probably saved me more than the purchase price within 48 hours. This is a quality product. Komodo wouldn’t be possible without you, our users. Get the most out of Komodo and download the latest packages, userscripts and other add-ons, or post a question on our forum. Visit Our Community Site.